It is possible to test activesync connectivity and availability on an Exchange 2007 or 2010 server without a smartphone. The FASTEST way to test for access to activesync on an Exchange server without a smartphone is to enter the the activesync URL into your browser's address bar and connect to it. The message you receive will look like the one in this post but that is NORMAL. The reason we get that message, as erroneous as it looks, it because it's a browser not a smartphone. The smartphone not only connects to the activesync URL but it also passes login information which we do not when manually entering the URL address into our browser. The the text in the URL is CaSe sensitive. 501 header values specify a method that is not implemented. When receiving this "erro r" message during an active sync test without a smartphone, it is normal. Test activesync using a URL from a computer via a browser. 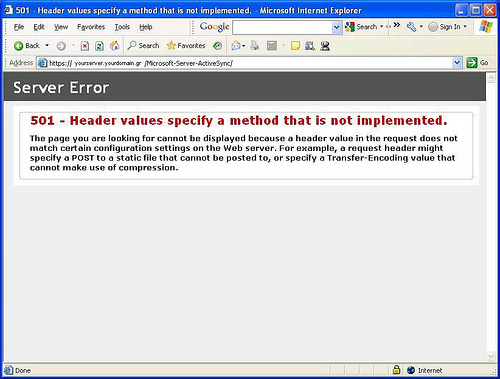 This page is normal for when connecting to an exchange 2007 server with SP1 or Exchange 2010 using a browser with the active sync URL as the address. The message between Exchange 2007 and Exchange 2010 differs much because of the differences in the IIS versions. It's only an appearance difference for an exchange 2007 server on windows 2003 or windows 2008 server . Also, on windows 2003 Server the IIS version differs enough and the error codes also different so that's what's going to generate a different looking 501 error in the browser. with Microsoft Exchange 2007 on Microsoft Windows 2003, the message reads 501/505 not implemented or not supported. The image above is Microsoft Exchange 2007 on windows server 2008. Microsoft Exchange 2010 on Windows 2008 or 2008 R2 will be the same because remember, it's IIS that's actually presenting the error code and page to the browser not Exchange.